New York Fashion Week vs. the Ready Made Garment Sector in Bangladesh: whose interests are protected when ‘special’ police hit the streets for fashion? The fashion industry is often seen as a complicated paradox. So much so that many professionals working in the field of worker rights and environmental security frequently shy away from using the word ‘fashion’ itself. In its place, they vote for ‘garment,’ ‘apparel,’ ‘textile,’ etc. While it’s natural for industry jargon to vary—different circles will have their own set of terminology—it is important to recognize that in the end we are all talking about the same thing: fashion. Fashion, after all, designs the stage and sets the pace for the performance. For our part, if we cannot connect human and environmental security issues taking place within the industry’s supply chain to the fashion runway, we haven’t dug deep enough. We were reminded further of this truth this week with a recent Ethical Style post on the special NYPD ‘fashion’ police slated for New York Fashion Week. According to the article, the plain clothed officers are placed amongst the crowd (positioned on either side of the runway), to keep the peace from anti-fur activist protesters. Continuing our coverage on Bangladesh, we’ve been meaning to write a story on the government’s reported consideration of a special “industrial police,” dedicated to keeping workers in the ready made garment (RMG) sector in line with an “iron hand,” according to a newspaper in Bangladesh (Clean Clothes Campaign). So, on either side of the supply chain, the industry flexes its muscles against unrest. But, when it comes to the systemic oppression of basic human rights, coupled with unchecked environmental degradation, whose interests are being protected? The truth is, when it comes to security there is no real paradox—the violations may be clear as mud, but we know where there are and how they got there. This entry was posted in A Closer Look, Animal Rights, Bangladesh, CSR, Environment, Fashion Design, Fashion Shows, Fast Fashion, Labour, REPORTS, Responsibility, Social, Social Conditions, Social Responsibility, Supply Chain, Transparency and tagged #SABangladeshProject, Anna Wintour, Bangladesh, New York Fashion Week on February 1, 2011 by Mary Hanlon. We mentioned a while back that SA is a supporting partner of ECO Fashion Week Vancouver, coordinating the conference to promote education. Well, the conference schedule is set, and we are so excited! Here are the details, plus some abstracts, session learning objectives and recommended reading! The foundations of the science of global warming will be presented and a discussion of our present climate will be framed within a historical perspective of the Earth’s climate over the last 800,000 years. The range of projections of climate change over the next century will be summarized and the public confusion arising from the media portrayal of the science and its entry into the political arena will be discussed. Finally, how various international policy options fit within the framework of necessary actions required to reduce greenhouse gas emissions will be reviewed. This talk will be based on the book: Keeping our Cool: Canada in a Warming World. 1) How the media affects public perception of global warming science. 2) Future greenhouse gas emissions need to reduce to zero if we wish to deal with global warming. 3) Dealing with global warming is empowering. Everyone is part of the problem; everyone is part of the solution. The Lifecycle Stages are discreet intervals along the life of a finished product—and the materials which make up the product—where environmental impacts are realized. These stages include the processes of raw materials, manufacturing, delivering, using and managing the end of life for products. It is important to consider different ways of mitigating these impacts. 3) Mitigating the impacts during the lifecycle of an apparel item. Discussion on water use in the textile industry: creating awareness and helping people understand impact of the textile industry on water use and pollution. Paul will explain the various points where water use and pollution are factors in the lifecycle of a garment and opportunities for water-saving technologies and practices. 1) Further the understanding of life cycled assessment with particular assessment of water use in the textile industry. 2) Provide designer options on how to reduce water use into their choices of textile, dye, and decoration. A bird’s eye view on defining sustainability; international industry metrics; and the latest technologies to help designers and retail sourcing specialists source more sustainably. Talk includes a look into the source4style.com, a new B2B online marketplace that allows designers and retail sourcing specialists to search, compare and purchase more sustainable materials and services from a network of global suppliers – as well as some of the exciting sustainable trends that are surfacing. 4) Upcoming trends in sustainable materials, sourcing and style. Digging Deeper is an opportunity for tradeshow attendees to speak directly with key panel members and address any questions or concerns they might have coming out of the conference. Panel members will take questions from the audience to expand upon ideas presented throughout the conference and continue the conversation, investigating how these ideas are translated on the ground. 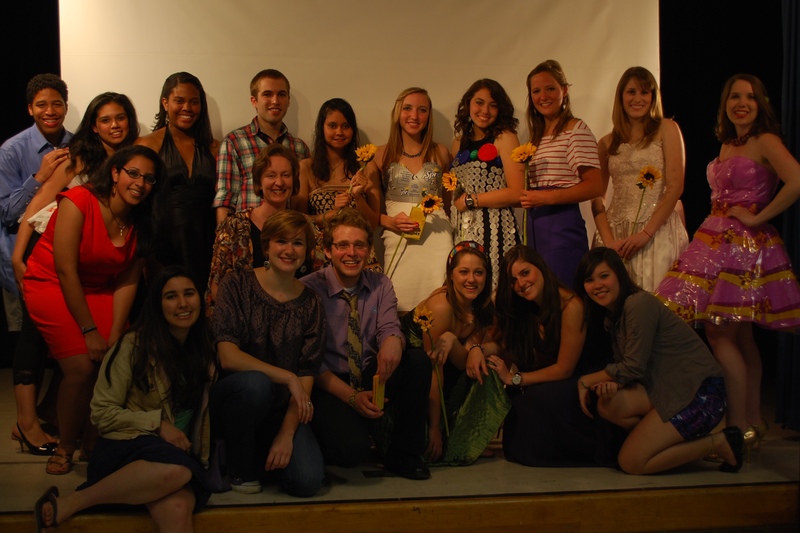 Visit ECO Fashion Week Vancouver for ticket information, and to learn more. 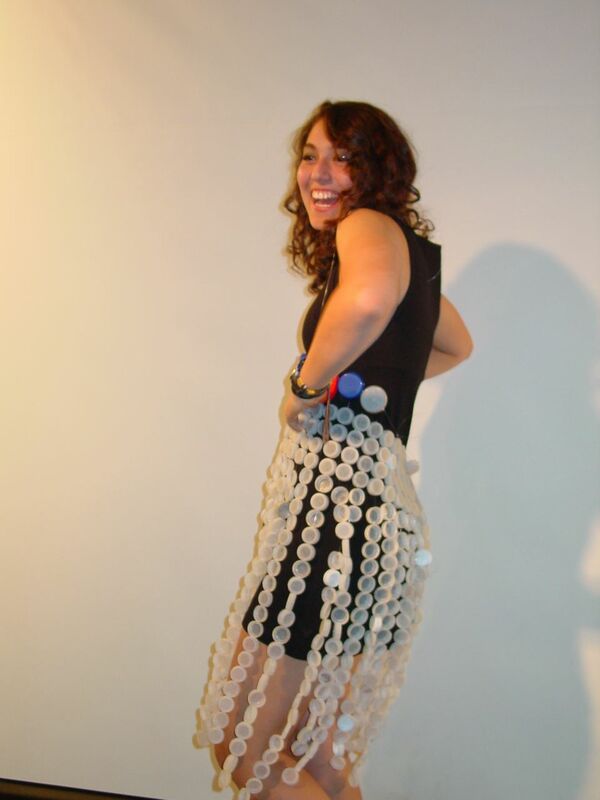 This entry was posted in Conferences, CSR, DESIGN, Environment, Events, fashion, Fashion Design, Fashion Shows, Landfill, Lifecycle Analysis, Responsibility, Water on September 16, 2010 by Mary Hanlon. “Save the dates for a dynamic line-up of informative lectures and panels, roundtable discussions, educational workshops, presentations, art installations, and fashion shows that will uncover the trends emerging throughout the world of eco-fashion. 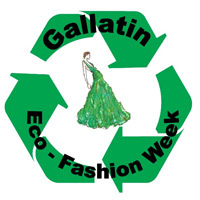 The majority of ideas featured at Gallatin Eco-Fashion Week 2010 will highlight the unique, original research of Gallatin community members. All events will be held at the NYU Gallatin School of Individualized Study / 1 Washington Place, New York, NY, 10003 (valid ID required toenter building). 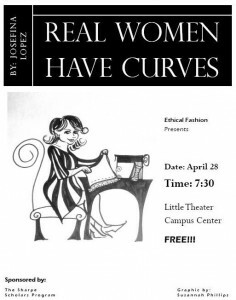 For more information: contact Jessica Lee. This entry was posted in Conferences, Consumer Education, DESIGN, Education, Environment, Events, fashion, Fashion Design, Fashion Shows, Fast Fashion, Human Rights, Labour, Lifecycle Analysis, Responsibility, Seminar, Social Conditions, Social Responsibility, Socially Responsible Design, Student Education, Supply Chain, Tutor Education on January 22, 2010 by Mary Hanlon. 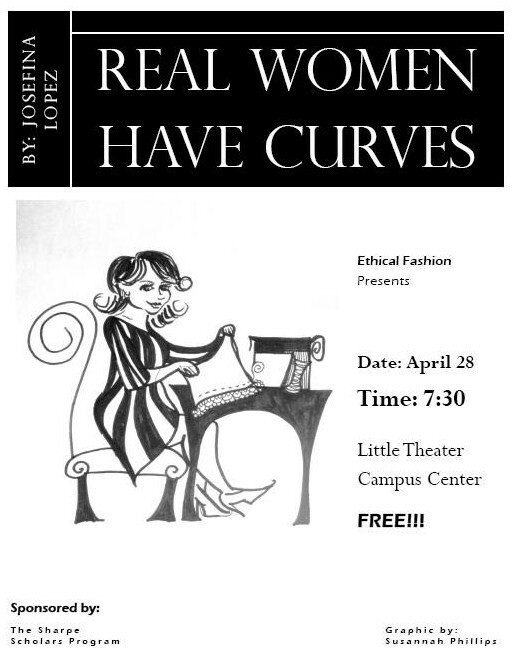 Looking for ways to get your students more involved with the ethical fashion movement? 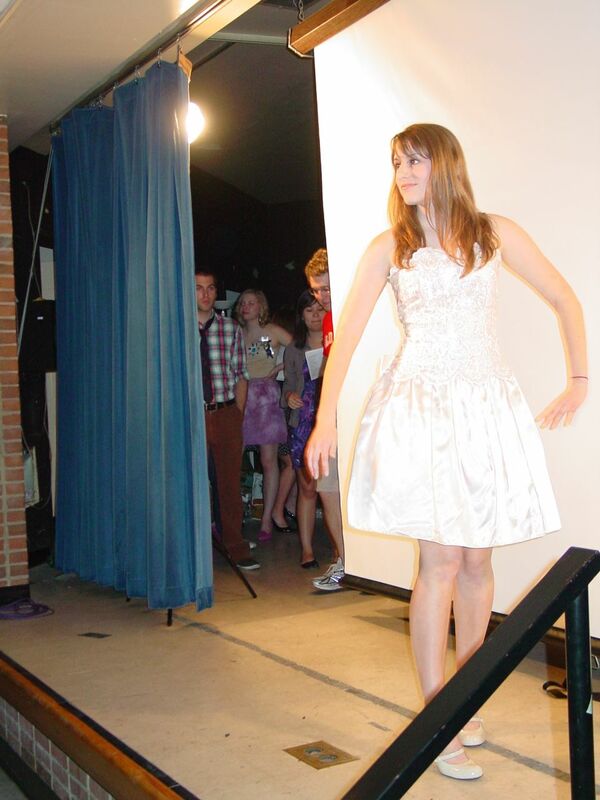 “People and Planet are holding a national competition for student groups who put on a Fairtrade Cotton fashion show to launch the Wear Fair campaign at their school or college. The group who organise the best show will win a bundle of clothes by cutting edge ethical designer Annie Greenabelle. They will also have the opportunity to meet a Fairtrade producer so they can hear first hand about the positive impact of their campaigning in their school or college. Click here to get started and here to enter the competition! Good Luck! This entry was posted in Competition, CSR, Education, Environment, Events, Fair Trade, fashion, Fashion Shows, Labour, Responsibility, Social, Social Responsibility, Socially Responsible Design, Student Education, Supply Chain, sustainable on January 19, 2010 by Mary Hanlon. The United Nations has declared 2010 the International Year of Biodiversity and the International Year for the Rapprochement of Cultures. “As the 2009 International Year for Natural Fibres draws to a close and the focus begins to shift to 2010, the International Year of Biodiversity, Green2greener is delighted to announce its collaboration with the United Nations Conference on Trade and Development (UNCTAD) on a series of activities that will highlight the importance of natural fibres and biodiversity in sustainable development strategies. EcoChic Geneva will take place on January 20-21, 2010 at the Palais des Nations, the UN headquarters in Geneva. The event will commence with a 1.5 day seminar which will look at “Redefining Sustainability in the International Agenda” from the perspective of the fashion and cosmetics industries. 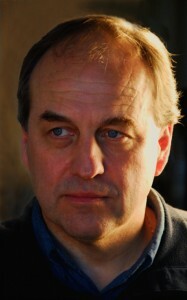 The seminar will be followed by a high-profile gala evening on Thursday 21 January. Highlights include the launch of a Sustainable Fashion Exhibition and dramatic EcoChic Fashion Show featuring sustainable and ethical ready-to-wear and couture looks by fashion designers from around the globe. The Exhibition will be subsequently opened to the public free of charge until February 4, 2010. This entry was posted in Conferences, Cradle to Cradle, CSR, DESIGN, Environment, Events, fashion, Fashion Design, Fashion Shows, Fast Fashion, Fibre/Material, Garment Care, Garment Disposal, Greenwashing, Human Rights, Labelling, Lifecycle Analysis, Responsibility, Seminar, Slow Fashion, Social Conditions, Social Responsibility, Socially Responsible Design, Supply Chain, sustainable, Transparency and tagged Biodiversity, Geneva, Hong Kong, Switzerland, UNCTAD, United Nations on January 13, 2010 by Mary Hanlon. “The GreenShows is the only premiere fashion event exclusively committed to ecofriendly, ethically-sound, fair-trade fashion in New York City. The GreenShows will produce a comprehensive canvas for full-length runway shows that feature an edited selection of 11 designers. Each designer will be given the opportunity to show their entire Fall 2010 collection before an audience of influential editors, buyers, and VIPs. 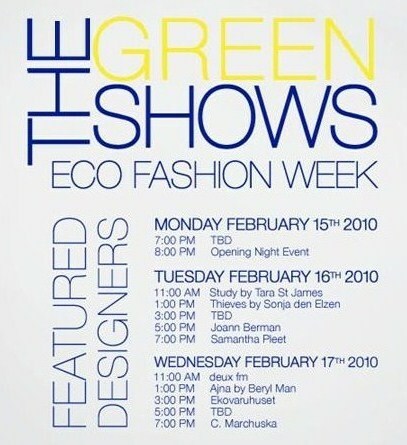 The GreenShows will host an opening night runway show and event on Febuary 15, 2010 followed by two days of shows. An entirely green venue will house this eco extravaganza in downtown Manhattan. The GreenShows will coincide with New York City’s world-renowned Fashion Week and beyond the shows, Eco Fashion Week will be an immersive green experience for all attendees. This entry was posted in CSR, DESIGN, Environment, Events, fashion, Fashion Design, Fashion Shows, Responsibility, Social Conditions, Social Responsibility, Socially Responsible Design, Supply Chain and tagged Ajna, Beryl Man, C. Marchuska, deusx fm, Ekovaruhuset, Joann Berman, New York, Samantha Pleet, Sonja den Elzen, Tara St. James, Thieves on January 4, 2010 by Mary Hanlon.